We’d love your help. Let us know what’s wrong with this preview of Words of Wisdom for Women at the Well by Shannon Ethridge. 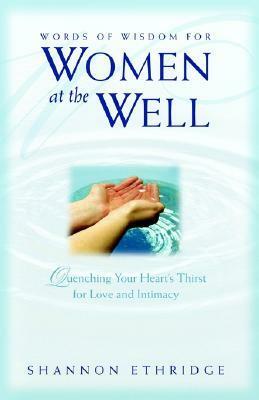 To ask other readers questions about Words of Wisdom for Women at the Well, please sign up. So far, sooo good, but I've had to put this book on hold because of school. Her passion for healthy sexuality was ignited as a result of her own painful experiences. After being sexually abused by uncles during puberty and surviving many painful years as a promiscuous teenager, Shannon sought to overcome her past and become the faithful wife she desperately wanted to be. Six months of individual and group counseling gave Shannon the confidence to declare her graduation from the school of hard knocks, and she began speaking boldly and bluntly about the benefits of sexual integrity and sexual intimacy within marriage. She has since taught and counseled thousands of teens, single adults, and married couples over the past decade. Shannon is the Gold-Medallion Award-winning author of 18 books, including the best-selling Every Woman’s Battle series (WaterBrook Press, 2003-2006) which has been printed in 11 different languages, the 5-book Loving Jesus Without Limits series (WaterBrook Press, 2007), and her new book for the mainstream market, The Sexually Confident Wife (Random House, September 2008).